Think you’ve got what it takes to be the quickest on track? 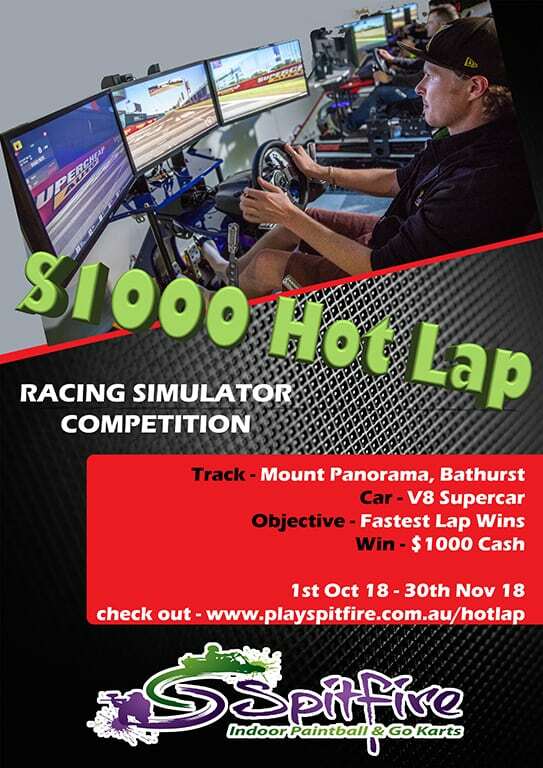 Pilot a V8 Supercar around Mount Panorama, Bathurst, in our Full Motion Racing Simulators in the quickest time to win $1000 Cash. Using our Professional Full Motion Racing Simulators, with Sequential Shifters, Full Axis Motion Simulation, Force Feedback Steering, Racing Seat, Surround Sound and Quad Display – the realism has never been better or more extreme. This is as close as it gets to the real thing as you guide your 650 horse power V8 beast around one of the most feared and respected Race Tracks in the world. Misjudge a corner, accelerate too early or brake too late and its all over. Get it right and you stand on the podium achieving what only the greats of drivers have done – a true Lap of the Gods. Every Thursday night from 5pm – 9pm is our Sim Race Night. Have as many races as you like on this heavily discounted Sim Race Night and chill out in our Custom Simulator Racing Room. Watch the other competitors or hook up a few machines for a Grand Prix event. With a huge choice of Cars and Tracks – our team members will be on hand to set you up for some extreme Simulator Racing. Using one of our Full Motion Racing Simulators, Sequential Shifter and assists OFF. Choice of Holden, Ford or Nissan V8 Supercar. Set your lap in a Practice, Qualifier or Race. Unlimited Practice Laps & Attempts. Lap must be watched and verified by our Team Members.